Jesus, truly risen from the dead, goes to meet Mary in the garden. Jesus must have been excited to see her as well. Through Christ’s glorification we have become flesh-and-blood children of his Father. Christ can truly say, “What is mine is yours, and what is yours is mine” (cf. Jn 17:10). "Christ once raised from the dead will never die again. Death has no more power over him" (Romans 6:9). And us? On the first day of the week,a Mary of Magdala came to the tomb early in the morning, while it was still dark,* and saw the stone removed from the tomb. * So Peter and the other disciple went out and came to the tomb. and the cloth that had covered his head, not with the burial cloths but rolled up in a separate place. * For they did not yet understand the scripture that he had to rise from the dead. Then the disciples returned home. Friends, our Easter Gospel contains St. John’s magnificent account of the resurrection. It was, says John, early in the morning on the first day of the week. It was still dark—just the way it was at the beginning of time before God said, “Let there be light.” But a light was about to shine, and a new creation was about to appear. The stone had been rolled away. That stone, blocking entrance to the tomb of Jesus, stands for the finality of death. When someone that we love dies, it is as though a great stone is rolled across them, permanently blocking our access to them. And this is why we weep at death—not just in grief but in a kind of existential frustration. What was dreamed about, what endured as a hope against hope, has become a reality. God has opened the grave of his Son, and the bonds of death have been shattered forever. Psalm 118: This is the day the Lord has made; let us rejoice and be glad. Welcome to Easter Sunday morning! Resurrection Sunday! Resurrection is a theme not only for today, it is also prevalent in the lives of proactive Christians. Resurrection of the young pregnant woman who is homeless and has been living a self-destructive life. Resurrection of virtue for the person who chooses to live a live devoted to chastity, a virtue we teach at Good Counsel. Resurrection of a life that had been enslaved by domestic violence or from the manipulation of someone’s vice. Jesus rises from the dead so we may have a new life, and that is what we celebrate today. Yes, weather permitting, we will have some outdoor Easter egg festivities, and chocolate rabbits will be handed out to our Good Counsel children. But we will be sure that our moms and children will have the opportunity to go to church in order to worship the One who makes all things new – the One who we sing Alleluia to, Our Resurrected Lord! This is the day the Lord has made; let us rejoice and be glad! Amen. There are no readings for today. Today is a good day to wait. Some churches will have a Tenebrae service this morning, and if possible, please try to attend. Many of the readings and reflections speak about this very unique time of God waiting. As Americans, we often do not like to wait, and many will start Easter very early on this Saturday. But just like how a pregnant mom at Good Counsel will often need to wait the full nine months before the new life inside her is ready to burst forth, let us try to take this full day of Holy Saturday peacefully resting with the Lord. Dear Jesus, thank you for taking a day to rest and helping me to more fully appreciate all that You sacrificed for me. May I never forget You are the Prince of Peace. Amen. After the sabbath, as the first day of the week was dawning,* Mary Magdalene and the other Mary came to see the tomb. * And behold, there was a great earthquake; for an angel of the Lord descended from heaven, approached, rolled back the stone, and sat upon it. * He is not here, for he has been raised just as he said. Come and see the place where he lay. Then they went away quickly from the tomb, fearful yet overjoyed, and ran to announce* this to his disciples. * And behold, Jesus met them on their way and greeted them. They approached, embraced his feet, and did him homage. Friends, on this Holy Saturday our Gospel we hear St. Matthew's account of the resurrection. The resurrection of Jesus from the dead is the be-all and end-all of the Christian faith. If Jesus didn't rise from the dead, all bishops, priests, and Christian ministers should go home and get honest jobs, and all the Christian faithful should leave their churches immediately. As Paul himself put it: "If Jesus is not raised from the dead, our preaching is in vain and we are the most pitiable of men." It's no good, of course, trying to explain the resurrection away or rationalize it as a myth, a symbol, or an inner subjective experience. None of that does justice to the novelty and sheer strangeness of the Biblical message. It comes down finally to this: if Jesus was not raised from death, Christianity is a fraud and a joke. But if he did rise from death, then Christianity is the fullness of God's revelation, and Jesus must be the absolute center of our lives. There is no third option. Nothing is beyond the suffering of Jesus. He dwells in our darkness—not inert and careless, but as one who feels it all: the emptiness, the gloom, the despair. He has taken it all on himself. Psalm 31: Father, into your hands I commend my spirit. There is much to reflect upon today and, if possible, do try to make it to a 3 pm Good Friday service this afternoon. If not, your local church may also have a Stations of the Cross service during the evening, which you may also find spiritually edifying. One cannot reflect upon today, which carries the name Good Friday, without attempting to come to grips with the mystery that God dies. How can God, who created the universe and gives us life, die? God is mysteriously Father, Son and Holy Spirit. How can three persons in one have one member—His Son—die? Most of us can understand one thing: Jesus does die to save us and His faithfulness should bring us joy. Dear Jesus, You are the true Suffering Servant, the Lamb Who was Slain. Thank you for dying for me and for allowing my sins to be forgiven and washed clean. Let me solemnly mark this Good Friday with a grateful heart and do whatever I can to help the poor. Amen. Holy Thursday begins the Triduum, the three days that lead up to Easter Sunday. Technically Lent ends, but there is still fasting and abstinence from meat that is encouraged for tomorrow, Good Friday. Mass is generally celebrated during the evening to coincide with the Gospel, which commemorates Jesus’ celebrating Passover and His Last Supper, which institutes the Eucharist, the priesthood, and a life dedicated to service. It might be simplistic to say but most who work at Good Counsel do so in the context of Christian service. There may be similar secular jobs where staff can work, but the opportunity to more fully help people in a Christian environment motivates many because it gives them an opportunity to live out their faith. Whether we work in Christian ministry or not, Jesus does invite all of us to live a more deeply meaningful life. The invitation begins on this Holy Thursday. If you can, perhaps you can go to church tonight and maybe invite a friend. Dear Jesus, thank you for giving Yourself fully to us and for teaching us that we are to wash each other’s feet. Always keep a desire in my heart to more fully live a life devoted to You. Amen. Friends, today in the Gospel Jesus declared that he fulfilled the prophecy of Isaiah: "The Spirit of the Lord is upon me because he has anointed me to bring glad tidings to the poor." Jesus came preaching the Kingdom of God. The deaf hear, the blind see, the lame walk. The dead are raised to life, enemies are forgiven, and the poor have the good news preached to them. And ultimately in his resurrection, Jesus' followers saw that the old world—the world predicated upon death and the works of death, the world that had done Jesus in—was now defeated. God had definitively declared his opposition to that world and his support of the new one. So awed were they by the resurrection—and you can sense it in every book and letter of the New Testament—that they awaited the imminent arrival of the new state of affairs, the return of Jesus and the establishment of God's kingdom. Though Jesus did not immediately return, the old world was over and broken. It was fully compromised, and its destruction is now just a matter of time. Holy Thursday: Lent has ended and this evening the Sacred Paschal Triduum begins. What I receive from the Eucharistic Liturgy is about what God has done, and all that God promises to do. As Catholics, our daily lives are not fully broken open until joined with others in praising and thanking God in the midst of our human situation. In giving us the Eucharist, Jesus gives us "a pledge of future glory." His resurrection is the guarantee. Psalm 69: Lord, in your great love, answer me. Many of us enjoy getting away, maybe even taking a vacation away from the hustle and bustle of our ordinary life. Some of us will retreat formally or informally in order to hear the voice of God. And then there are others who even when away in the wilderness will not or cannot hear the voice of God because the interior noise is so great. In today’s Gospel there is a sense that although Judas has not gone off to the wilderness or desert, he is very much alone. Judas is meeting with religious leaders, but we know he is not receiving good counsel, nor is he seeking any. None of us can adequately tell what is happening inside of Judas, but his actions speak loud and clear that even when we are away, whether on vacation or retreating into the wilderness, we need to be connected to The Vine. Jesus, You are the Good Shepherd and are always there to lead me. Be close by so whenever I am tempted to wander away, You will lead me back. Amen. Friends, today's Gospel recounts the preparations for Passover, which would be Jesus' final meal before his death. In Matthew's Gospel, the Last Supper takes place during Passover, the day when the paschal lambs were slaughtered. Why is this important? Because Christ is himself the paschal lamb who will be slaughtered for the salvation of the world, and this sacrifice is made sacramentally present at every Mass. Interestingly, Judas is present there at the Last Supper, the root of the Mass. This is startlingly good news. Why? It means Jesus associates with all of us sinners, in all of our dysfunction. He entered into the darkness in all of its power in order to bring the light. If even Judas was invited into the Lord's presence, so are you. In Communion we receive the Body and Blood of Christ. So simply, so humbly, he makes himself our food and our drink. He wants to be intimately united to us, to become one with us so we can become one with him. Do you hunger for the Bread of Life? What happens when a tree is not flexible enough to bend, especially if there is a storm? The tree breaks. We see two people in today’s Gospel with contrasting dispositions. Mary, the sister of Lazarus, who has bent herself and is extravagantly serving Jesus. Then there is Judas, who has not adapted well and has cut himself off from serving. In fact, he is ready to betray Our Lord for money. Two people who saw the same miracle of Lazarus being raised from the dead, and yet there are two very different reactions. This is not unique. We see some women at Good Counsel who are given wonderful opportunities to start a new life for themselves and for their baby. Some choose to proceed whole heartedly while others do not. Ultimately it is our choice whether we make the most of the life God gives us. Dear Jesus, let me always see You as my Light and my Salvation. Help me to consistently bend my will so it coincides with Yours. Amen. * Six days before Passover Jesus came to Bethany, where Lazarus was, whom Jesus had raised from the dead. Mary took a liter of costly perfumed oil made from genuine aromatic nard and anointed the feet of Jesus* and dried them with her hair; the house was filled with the fragrance of the oil. Friends, in today's Gospel, Mary of Bethany anoints Jesus for his death and burial. By this act, she anticipates the visit of three women to the tomb of Jesus. Early on the morning of the first day of the week, Mary Magdalene, Mary the Mother of James, and Salome bring spices to anoint the body of Jesus. They look in and see a young man—and they are frightened out of their wits. Can you imagine? You walk into a tomb, fully expecting to see a dead body, and you see instead someone alive and well--someone different than the man who was buried there! But that is not the end of their surprise. The man announces that the Jesus whom they seek is not there, that he has been raised up and will go ahead of them into Galilee. From this grave of Jesus we learn that everything we took to be the case is not the case. God is the enemy of death, and he has shown us his power over death in the most unambiguous way; our lives no longer need to be dominated by the fear of death, and we see the proof of this in the most vivid way imaginable. Keep all of that in mind as we read this beautiful story of Mary of Bethany anointing the feet of Jesus. The cross: it is the privilege of the Christian, a stumbling block to the world. Inherent in our baptism, infallible in its coming, incalculable in its graces, the cross enters all our lives sooner or later. Its coming will make or break us. It often makes us only after breaking us. What might you discover if you suddenly quit running away from the crosses in your life? God's whole plan for you is that you should know the full joy of being loved. Only then can you know the joy of loving in return. If we’re like the average Christian, we can be prone to letting our relationship with God slide. In a good marriage, both partners need to communicate and experience intimacy often. So too with God, we must take time to enjoy intimate times of refreshing. God always shows up for a designated “quiet time.” So must we if we desire deep intimacy with God. Darlene’s story is not unique. Some reports say that as little as 25-percent of people who identify themselves as Christian go to church every Sunday. The theme of this year’s Lenten reflections is, “Come back to me with all your heart.” Perhaps before throwing stones at others we might first look at the areas of our life that may be duplicitous. Are you the same person publicly in church today that you will be later this week when you are at work, at home, or driving through rush hour traffic? Son of David, You are my king, in and out of season. Help me to live in a consistent manner so I am always recognizable as a follower of You. Amen. he continuously does for you, breathing life into you, keeping you in existence. Today be extra aware of your breathing, a palpable experience of the sustaining breath of God. Responsorial (Based on Jeremiah 31): The Lord will guard us, as a shepherd guards his flock. Last summer when World Youth Day was held in Poland, Pope Francis tried to mingle with as many young Christian pilgrims as possible. It became a bit of a logistical nightmare for the security detail that was assigned to protect him whenever he decided to break protocol and ask a young person to come to him through a security barrier. In today’s Gospel there is a note of sadness when we read, “So Jesus no longer walked about in public among the Jews.” The reason was that the authorities at the time were committed to kill him and precautions needed to take place. Some of the mothers who come to Good Counsel also need to take precautions. Some have come out of domestic violence situations and need to leave their old neighborhoods. During this past year Good Counsel received five women who were victims of human trafficking – many of them frightened that their abusers would abduct them. Clearly, a main emphasis of the work done at Good Counsel is tangible: taking in homeless pregnant women. But there is also the spiritual and emotional: letting each mother and child know they are loved and protected. This is not always easy, and it can painfully stretch your heart as you love unconditionally. But the payoff is eternally satisfying! Dear Jesus, as we get ready for Holy Week, help me to be unafraid as I allow You to stretch my heart to the point of almost breaking. Let me love as You love! Amen. Psalm 18: In my distress I called upon the Lord, and he heard my voice. Next week is Good Friday when we commemorate Jesus being sacrificed on the cross and dying for our sins. If we were to compare our Lenten journey to a baseball game, we might say that we are in the late innings. But there is still time for a comeback or to make a commitment in order to open our heart to God. As we see in today’s Gospel, God is in control despite all of the threats to Jesus and for His safety. Jesus was to celebrate one last Passover with His friends before He would become the Lamb to be slain. On this Lenten Friday when the Church again asks us to abstain from eating meat, and when some of us may fast and give up other pleasures, perhaps we can reflect on the times in our life when we noticed God’s timing and when He acted just at the right moment. In the quiet of your heart ask Him to remind you of a circumstance that you may have forgotten. If possible, why not keep a journal of all the times God has blessed you. Dear Jesus, thank you for Your faithfulness and for Your perfect timing. Always remind me of how much real control You do have on the world around me. Help me not to get discouraged when I see the chaos that surrounds the world and the threat of death that encompasses many areas. Amen. The Jews again picked up rocks to stone him. * Jesus answered them, “Is it not written in your law, ‘I said, “You are gods”’? can you say that the one whom the Father has consecrated* and sent into the world blasphemes because I said, ‘I am the Son of God’? [Then] they tried again to arrest him; but he escaped from their power. Friends, in today's Gospel, Jewish leaders attempt to stone Jesus because he claimed to be the Son of God. He defended his identity, saying "If I do not perform my Father's works, do not believe me; but if I perform them, even if you do not believe me, believe the works, so that you may realize [and understand] that the Father is in me and I am in the Father." At the Last Supper, Jesus would further explain his intimate relationship with the Father. There he lays out for us the co-inherence that obtains at the most fundamental dimension of being, that is to say, within the very existence of God. "Lord," Philip said to him, "show us the Father, and that will be enough for us." Jesus replied, "Philip, after I have been with you all this time, you still do not know me? Whoever has seen me has seen the Father." How can this be true, unless the Father and the Son coinhere in each other? Though Father and Son are truly distinct, they are utterly implicated in each other by a mutual act of love. As Jesus says, "It is the Father who lives in me accomplishing his works." Can you count your blessings in the past day—even seemingly small blessings, such as a friend calling, or the sun pouring in your window, or waking up on time? What is the most wonderful thing God is doing for you today? Psalm 105: The Lord remembers his covenant for ever. “How do I know I can trust God?” Silvia asked a Good Counsel volunteer who was teaching a Life Skills class. “Because He keeps all of His promises,” our volunteer patiently answered. “And if you don’t believe me then you can read it in here,” she said pointing to the Bible. Today’s first reading starts with a promise God makes to Abraham that he will be a father of many nations over many years, and this promise continues and expands with the coming of Jesus, who says Abraham was pleased to see Him come. Our responsorial psalm for today should serve as a reminder that God is good for His word and that we need to trust Him more and more. Jesus, You are the Great I AM. Inspire me to more deeply study Your Word so I can be more confident in explaining how faithful You are in fulfilling Your promises. Amen. You do not know him, but I know him. And if I should say that I do not know him, I would be like you a liar. But I do know him and I keep his word. Abraham your father rejoiced to see my day; he saw it* and was glad. Friends, today Jesus refers to himself as “I AM,” the name God revealed to Moses. So, let’s reflect on this episode from Genesis. While tending sheep in the hill country, Moses sees a strange sight. There an angel of the Lord appears to him in fire, flaming out of a bush. God sees him and calls him by name: “Moses, Moses. I am the God of your fathers, the God of Abraham, the God of Isaac, the God of Jacob.” This is a very familiar God, one who knows Moses’ ancestors. If God’s love is to be real, people need to find a bridge between the experience of God’s love and the personal experience of being loved by another person. If the God you know is not as loving as the best people you know, then you do not yet know God. Could it be that your own loving kindness is a sign of God's love for someone? He said to them, “You belong to what is below, I belong to what is above. You belong to this world, but I do not belong to this world. * So they said to him, “Who are you?”q Jesus said to them, “What I told you from the beginning. Friends, in today's Gospel Jesus prophesies his crucifixion and his Father's role in his coming death. What enabled the first Christians to hold up the cross, to sing its praises, to wear it as a decoration is the fact that God raised up and ratified precisely this crucified Jesus. "You killed him, but God raised him up." Therefore, God was involved in this terrible thing; God was there, working out his salvific purposes. But what does this mean? There have been numerous attempts throughout the Christian centuries to name the salvific nature of the cross. Let me offer just one take on it. It became clear to the first Christians that somehow, on that terrible cross, sin had been dealt with. The curse of sin had been removed, taken care of. On that terrible cross, Jesus functioned as the "lamb of God," sacrificed for sin. Does this mean God the Father is a cruel taskmaster demanding a bloody sacrifice so that his anger might be appeased? No, Jesus' crucifixion was the opening up of the divine heart so that we could see that no sin of ours could finally separate us from the love of God. Even though we feel lack of peace, inner agony, strife, and endless turmoil, God is folding us in his own goodness and meekness. We may feel bad about ourselves, but God does not. Over the roar of the storms in your life, hear the firm, authoritative command of Jesus, "Quiet! Be still!" Psalm 23: Even though I walk in the dark valley I fear no evil; for you are at my side..
For a number of years Good Counsel has operated an outreach called Lumina, which means light. It is an outreach for those suffering from a past abortion experience in order to promote and assist with emotional and psychological healing. Jesus’ words, "Neither do I condemn you. Go, and from now on do not sin anymore," do bring comfort to many as they point out that any sin, no matter how great, can be forgiven. Today let’s take some time and pray for those who are emotionally hurting from a past abortion experience, and if you ever get the chance, please consider referring Lumina to whomever may be looking for healing. See www.PostabortionHelp.Org or call (877) 586-4621. All correspondences are confidential. Jesus, You are the Great Physician who can heal any and all maladies internally and externally. And You have the power to forgive all sin. Keep me close to You so I may always be close to Your tender care. Amen. And then he says, “Let the one among you who is without sin be the first to cast a stone at her.” He forces them to turn their accusing glance inward, where it belongs. Instead of projecting their violence outward on a scapegoat, they should honestly name and confront the dysfunction within themselves. This story, like all the stories in the Gospels, is a foreshadowing of the great story toward which we are tending. Jesus will be put to death by a mob bent on scapegoating violence. “How long till we get there?” Carla, a Good Counsel mom, asked when she was being driven from the Bronx to our home on Staten Island, New York. “Not much longer,” Victoria, one of our house managers, told her in the car as she worked her way through city traffic. Carla was focusing on her final destination as she began mentally preparing for a new life in a new environment. In today’s Gospel, the story of Lazarus being raised from the dead, we have a chance to focus on Jesus calling us out of death and into a new life. One day our earthly bodies will rise and be resurrected into a new transformed state, and it is this faith that we hear from Martha when she proclaims, "Yes, Lord. I have come to believe that you are the Christ, the Son of God, the one who is coming into the world." It took courage for Martha to not only proclaim her trust in Jesus but also to give permission for the stone covering the tomb of her dead brother to be removed. Without this permission, the miracle does not take place. On this Sunday, let’s reflect on what kind of permission Jesus may be asking us for. What stones does He want you to move so that a modern day miracle may occur? Dear Jesus, speak to my heart so I may confess You as my Lord and Savior, and gently ask me to open my life in a way so You may act mightily for the benefit of others. Amen. Now a man was ill, Lazarus from Bethany,a the village of Mary and her sister Martha. Jesus answered, “Are there not twelve hours in a day? If one walks during the day, he does not stumble, because he sees the light of this world. So then Jesus said to them clearly, “Lazarus has died. Now Bethany was near Jerusalem, only about two miles* away. So they took away the stone. And Jesus raised his eyes and said, “Father,* I thank you for hearing me. Friends, today's Gospel speaks of Jesus' conquest of death in the raising of Lazarus. What if death is not at all what God intended. Mind you, I mean death as we experience it—as something fearful, horrible, terrifying. This comes from having turned from God. Jesus came primarily as a warrior whose final enemy is death. It is easy to domesticate Jesus, presenting him as a kindly moral teacher. But that is not how the Gospels present him. He is a cosmic warrior who has come to do battle with those forces that keep us from being fully alive. Throughout the Gospels, Jesus is dealing with the effects of death and a death-obsessed culture: violence, hatred, egotism, exclusion, false religion, phony community. But the final enemy he must face down is death itself. Like Frodo going into Mordor, he has to go into death's domain, get into close quarters with it, and take it on. Coming to Lazarus' tomb, Jesus feels the deepest emotions and begins to weep. This is God entering into the darkness, confusion, and agony of the death of sinners. He doesn't blithely stand above our situation, but rather takes it on and feels it at its deepest level. * After this, Jesus moved about within Galilee; but he did not wish to travel in Judea, because the Jews were trying to kill him. Jesus answered them, “I told you* and you do not believe. The works I do in my Father’s name testify to me. My Father, who has given them to me, is greater than all,* and no one can take them out of the Father’s hand. Friends, the Gospel for today centers around a theme that we can never speak of enough: the divinity of Jesus. There has been a disturbing tendency in recent years—you can see it clearly in Eckhart Tolle's bestselling book, The Power of Now—to turn Jesus into an inspiring spiritual teacher, like the Buddha or the Sufi mystics. But if that's all he is, the heck with him. The Gospels are never content with such a reductive description. Though they present Jesus quite clearly as a teacher, they know that he is infinitely more than that. They affirm that something else is at stake in him and our relation to him. In our Gospel today, Jesus he plainly declares his relationship with his Father: "I did not come on my own, but the one who sent me, whom you do not know, is true. I know him, because I am from him, and he sent me." Psalm 106: Remember us, O Lord, as You favor Your people. As we progress through Lent we see Moses in today’s first reading pleading mercy on behalf of the people who have sinned. We also see in today’s Gospel Jesus getting close to dying on behalf of all of us, who have sinned, so we may be saved. In both cases God respects the wishes of those who are asking for mercy, and so one question to reflect upon is: What is our response to the mercy of God? Let’s examine our heart today and see where there may still be some distance from where God is and where we are currently situated. Let’s resolve every day to inch close and closer to Our Lord. Merciful God, help me to come back to you with all my heart! Amen. “If I testify on my own behalf, my testimony cannot be verified. But there is another* who testifies on my behalf, and I know that the testimony he gives on my behalf is true. He was a burning and shining lamp,* and for a while you were content to rejoice in his light. and you do not have his word remaining in you, because you do not believe in the one whom he has sent. You search* the scriptures, because you think you have eternal life through them; even they testify on my behalf. Friends, in today's Gospel, Jesus declares the source of his authoritative behavior. Notably, the first hearers of Jesus were astonished by the authority of his speech. This wasn't simply because he spoke with conviction and enthusiasm; it was because he refused to play the game that every other rabbi played, tracing his authority finally back to Moses. He went, as it were, over the head of Moses, as he did at the beginning of the Sermon on the Mount: "You've heard it said…but I say." His listeners knew they were dealing with something qualitatively different than anything else in their religious tradition or experience. They were dealing with the prophet greater than Moses. And Jesus had to be more than a mere prophet. Why? Because we all have been wounded, indeed our entire world compromised, by a battle that took place at a more fundamental level of existence. The result is the devastation of sin, which we all know too well. Who alone could possibly take it on? A merely human figure? Hardly. What is required is the power and authority of the Creator himself, intent on remaking and saving his world, binding up its wounds and setting it right. Psalm 145: The Lord is gracious and merciful. “Jenny, please don’t slurp your drink, your younger brother is imitating you,” Cassandra, a Good Counsel mom of two, was imploring her four-year-old. Imitation is the greatest form of flattery, so perhaps today we can honor God and His Son, Jesus, by trying to resemble their loving actions. O Sacred heart of Jesus, let my heart shine and love in imitation of thee. Amen. The Work of the Son. * Jesus answered and said to them, “Amen, amen, I say to you, a son cannot do anything on his own, but only what he sees his father doing;k for what he does, his son will do also. For just as the Father raises the dead and gives life,* so also does the Son give life to whomever he wishes. “I cannot do anything on my own; I judge as I hear, and my judgment is just, because I do not seek my own will but the will of the one who sent me. Friends, in today’s Gospel we see Jesus as the judge who shows mercy and love. It is hard to read any two pages of the Bible—Old Testament or New—and not find the language of divine judgment. Think of judgment as a sort of light, which reveals both the positive and the negative. Beautiful things look even more beautiful when the light shines on them; ugly things look even uglier when they come into the light. When the divine light shines, when judgment takes place, something like real love is unleashed. Someone might avoid seeing the doctor for years, fearful that he will uncover something diseased or deadly. But how much better it is for you, even when the doctor pronounces a harsh “judgment” on your physical condition! And this is why judgment is the proper activity of a king. It is not the exercise of arbitrary power, but rather an exercise of real love. John’s Gospel today tells the story of a royal official who has an open heart to Jesus’ promise that his son will be healed and live, even without Jesus visiting the home in person. We have to remind ourselves that this is an age where there were no telephone lines, fax machines, computers, or internet. People visited each other to communicate and to carry out tasks. Even today we often bring a sick person to a prayer service or invite a priest over to spiritually minister to someone ill. And yet the royal official has enough faith that he trusts that Jesus can and will do what He promises. Let’s spend some time today thanking Our Lord by reflecting on Psalm 30 and how He rescues us even when we are not directly in His presence. Jesus, my Savior, help me to trust you more and more each day. Remind me that for you, all things are possible. Amen. * After the two days, he left there for Galilee. * For Jesus himself testified that a prophet has no honor in his native place. Friends, our Gospel today tells of Jesus healing a royal official's son. The official asked him to heal his son, who was near death. Jesus said to him, "Unless you people see signs and wonders, you will not believe." But the royal official persisted. And Jesus told him his son would live. The man believed Jesus and his son recovered. Theologian Paul Tillich said that "faith" is the most misunderstood word in the religious vocabulary. And this is a tragedy, for faith stands at the very heart of the program; it is the sine qua non of the Christian thing. What is it? The opening line of Hebrews 11 has the right definition: "Faith is confident assurance concerning what we hope for, and conviction about things we do not see." Faith is a straining ahead toward those things that are, at best, dimly glimpsed. But notice, please, it is not a craven, hand-wringing, unsure business. It is "confident" and full of "conviction." Think of the great figures of faith, from Abraham to John Paul II: they are anything but shaky, indefinite, questioning people. Like the royal official, they are clear, focused, assured. Speaking with God about everything that happens in our day is so simple, yet it can be elusive when we try to practice it daily. In its simplicity it brings together life and prayer in one unending conversation. What if prayer were not about our talking to God, but about God's ongoing communication with us? Speak to God about everything that happens or that doesn’t happen, about how you feel and how you wish you were feeling, about things that go right and things that go absolutely wrong. Then give God time and space to talk about these things with you. If your thoughts tend to wander in prayer, notice where they wander and point that out to God. It may be just what you need to pray about! * As he passed by he saw a man blind from birth. and said to him, “Go wash* in the Pool of Siloam” (which means Sent). So he went and washed, and came back able to see. Now Jesus had made clay* and opened his eyes on a sabbath. * His parents said this because they were afraid of the Jews, for the Jews had already agreed that if anyone acknowledged him as the Messiah, he would be expelled from the synagogue. * It is unheard of that anyone ever opened the eyes of a person born blind. Friends, today’s Gospel is the story of the man born blind, which is a microcosm of the spiritual life. “As Jesus passed by, he saw a man blind from birth.” Jesus responds by doing something a little weird: he makes a mud paste and rubs it on the blind man’s eyes. And then Jesus tells the man to wash in the pool of Siloam. When the man comes back able to see, his neighbors are confused. Some say it’s the same guy, and others say it just looks like him. This is wonderful. Once you’ve put on the Lord Jesus Christ, you’re changed in every aspect of your life to the point where you may seem odd and different to others. But that wasn’t the end of the story. It then takes a dramatic turn. The Pharisees interrogate the healed man. It becomes clear that Jesus healed him on a Sabbath day and so they condemn Jesus. They throw the formerly blind man out, but Jesus looks for him. He asks the man: “Do you believe in the Son of Man?” Jesus wants us to put every ounce of our trust in him—and our vision will deepen. This in many ways is the heart of the matter: de-center your ego and re-center it on Christ. And now that you see, believe! Psalm 23: The Lord is my shepherd; there is nothing I shall want. Paul Baloche, a noted Christian musical artist, wrote a song in the late 1990’s called, “Open the eyes of my heart.” It was very well received and has been recorded and performed by many individuals and groups around the world. Yes, it is possible to see with our heart and also to become blinded by closing our heart as we read in today’s Gospel. Fear can close our heart as we see from the parents of the man born blind, who did not wish to receive religious banishment from the Pharisees and other Jewish leaders. Today might be a good time to reflect how well your heart’s vision is. Are there any blind spots that close your heart from being open to love as fully as it can? Open the eyes of my heart, Lord. Open the eyes of my heart so I may see You more clearly. Amen. Lent can ready our souls for the peace God brings about when we finally recognize the radiant gift of his life in us. It is this light that grabs our attention and makes us see another option for dealing with contradictions, sorrows, and pain. We can lose peace when our focus is on what we or others are doing, rather than on God's faithfulness in our lives. Where does your attention usually drift? Friends, our Gospel today introduces the most important Advent personage: Mary, the Mother of God. The Church Fathers often made a connection between Eve, the mother of all the living, and Mary, the Mother of God and Mother of the Church. In fact, they saw her as "the new Eve," the one who undid the damage done by Eve. The angel's greeting to Mary is important here: "Hail Mary, full of grace." Mary is greeted as someone who is able to accept gifts. Eve and Adam grasped; Mary is ready to receive. And Mary's reply is also significant: "How is this possible, for I do not know man?" There is nothing cowed about Mary. The angel explains to Mary: "The Holy Spirit will come upon you and the power of the Most High will overshadow you…" At the heart of the spiritual life is the conviction that your life is not about you. The real spiritual life is about allowing oneself to be overwhelmed by the one who loves us. Mary is someone who is ready for the impossible, and this makes her the paradigm of discipleship. "Let it be done to me according to thy word." That's an acquiescence to adventure. Psalm 40: Here I am Lord; I come to do Your Will. Our Lenten journey seemingly takes a break on this Saturday as we celebrate the Annunciation, but does it really? Mary’s fiat, her yes to God stating: “I am the handmaid of the Lord. May it be done to me according to your word,” is both inspirational and instructional on how we need to open our heart to God, especially when things do not make sense to us. “Why did God let this happen?” is a refrain many of our staff hear from the homeless, pregnant women we see at Good Counsel. Some may battle depression or anxiety as they try to cope with their lives being turned upside down. But it is comforting to know that someone went through a crisis pregnancy before they ever did and that they managed when they put their trust in God, who is the author of all life. Hail Mary, full of grace, the Lord is with thee. Blessed are thou among women. Blessed is the fruit of thy womb, Jesus. Holy Mary, Mother of God, pray for us sinners, now and at the hour of our death. Amen. Psalm 81: I am the Lord your God; hear My voice. Both of today’s readings and the responsorial psalm speak of the primacy of God and how we need to put Him above everything else. Our actions and lives must also reflect this belief as well. A number of years ago during Ash Wednesday, one of Good Counsel’s administrative workers went into a commercial business wearing ashes they had received during a Mass that morning. They noticed that many people took notice. Some smiled, some looked uncomfortable, and one employee at the business gave an embarrassed admission that they had wiped their ashes off their forehead because they were afraid of what reaction it might cause in their work place. On this Lenten Friday, when the Church asks us to abstain from meat and some of us may fast, perhaps we can take a moment to reflect on how humbly we project our faith in the public way we live out our life. Even a simple smile to someone as we walk into a store can reflect God’s love and help others to see the value of having priorities properly situated. Dear Lord Jesus, You are my king and I praise You! On this Lenten Friday I shudder to think that You allowed yourself to be placed on a throne which was a cross and that You were crowned with thorns. Each and every day may I more fully appreciate the love and sacrifice You made for me. Amen. And when Jesus saw that [he] answered with understanding, he said to him, “You are not far from the kingdom of God.” And no one dared to ask him any more questions. Friends, our Gospel today features what the ancient Israelites referred to as the Shema: "Hear O Israel, the Lord your God is Lord Alone." Could I invite you to make an examination of conscience on the basis of the Shema? Is God the one Lord of your life? Who or what are his rivals for your attention, for your ultimate concern? Or turn the question around: does absolutely everything in your life belong to God? You might ask, how do I give myself to a reality that I cannot see? This is where the second command of Jesus comes into play. When asked which is the first of all commandments, Jesus responded with the Shema, but then he added something to the tradition, a second command, namely, "You shall love your neighbor as yourself." There is strict logic at work here. When you really love someone, you tend to love, as well, what they love. Well, what does God love? He loves everything and everyone that he has made. So, if you want to love God, and you find this move difficult because God seems so distant, love anyone you come across for the sake of God. God our Father does not need perfection; he can work through our brokenness. Even our weakness reveals his glory, as St. Paul learned (see 2 Corinthians 12:10). Receiving God's forgiveness helps us become gentler with others: we become a sign of God's mercy! Today, carry out a seemingly insignificant task with great attentiveness "for the greater glory of God." He was driving out a demon [that was] mute, and when the demon had gone out, the mute person spoke and the crowds were amazed. If I, then, drive out demons by Beelzebul, by whom do your own people* drive them out? Therefore they will be your judges. But if it is by the finger of God that [I] drive out demons, then the kingdom of God has come upon you. When a strong man fully armed guards his palace, his possessions are safe. But when one stronger* than he attacks and overcomes him, he takes away the armor on which he relied and distributes the spoils. Friends, in today's Gospel we learn of a person possessed by a demon. Jesus meets the man and drives out the demon, but then is immediately accused of being in league with Satan. Some of the witnesses said, "By the power of Beelzebul, the prince of demons, he drives out demons." Jesus' response is wonderful in its logic and laconicism: "Every kingdom divided against itself will be laid waste and house will fall against house. And if Satan is divided against himself, how will his kingdom stand?" The demonic power is always one of scattering. It breaks up communion. But Jesus, as always, is the voice of communio, of one bringing things back together. Think back to Jesus' feeding of the five thousand. Facing a large, hungry crowd, his disciples beg him to "dismiss the crowds so that they can go to the villages and buy food for themselves." But Jesus answers, "There is no need for them to go away; give them some food yourselves." Whatever drives the Church apart is an echo of this "dismiss the crowds," and a reminder of the demonic tendency to divide. In times of trial and threat, this is a very common instinct. We blame, attack, break up, and disperse. But Jesus is right: "There is no need for them to go away." * “Do not think that I have come to abolish the law or the prophets. I have come not to abolish but to fulfill. I tell you, unless your righteousness surpasses that of the scribes and Pharisees, you will not enter into the kingdom of heaven. Friends, our Gospel for today is taken from the beginning section of the Sermon on the Mount. Jesus has symbolically established himself as the new Moses, giving a law upon a mountain. His "you have heard it said, but I say…" has revealed that he has authority even over the Torah. He is not speaking as an anti-Moses, but as a new Moses. Jesus is not undermining the law; he is raising it to a new pitch. This is why he says, "Amen, I say to you, until heaven and earth pass away, not the smallest letter or the smallest part of a letter will pass from the law." The law was always meant to bring humanity into line with divinity. In the beginning, this alignment was at a fairly basic level. But now that the definitive Moses has appeared, the alignment is becoming absolute, radical, complete. Now this is how the birth of Jesus Christ came about. When his mother Mary was betrothed to Joseph,* but before they lived together, she was found with child through the holy Spirit. Joseph her husband, since he was a righteous man,* yet unwilling to expose her to shame, decided to divorce her quietly. He had no relations with her until she bore a son,* and he named him Jesus. Friends, on this feast of St. Joseph, our Gospel focuses on some powerful spiritual themes, all of which surround the birth of Jesus. First we look at the sadness and the quandary of Joseph. He had become betrothed to Mary and then he finds that his betrothed is pregnant. So, the engagement has to be called off because of an irregular pregnancy. This must have pained him at the deepest emotional level: the feeling of betrayal by one he had loved. It is a wonderful tribute to the goodness of Joseph that he didn't vent his frustration. Instead, he looked to the feelings of Mary, resolving to divorce her quietly. Still, this must have been spiritual crisis for him. What does God want him to do? Then the angel appears to him in a dream and tells him to take Mary as his wife. Joseph realizes that these puzzling events are part of God's much greater plan. He was willing to cooperate with the divine plan, though he in no way knew its contours or deepest purposes. Like Mary at the annunciation, he trusted and let himself be led. Psalm 89: The son of David will live for ever. Traditionally, March 19 is dedicated to Saint Joseph, spouse of the Blessed Virgin Mary, but since this date falls on a Lenten Sunday this year, the feast day gets pushed ahead to today. Joseph is called “Son of David” in today’s Gospel, and one can imagine that this title got his attention and inspired him toward following God’s advice. Joseph did not know how things would work out with a child whom he did not help conceive, but once he made up his mind to cooperate with God’s plan, his commitment was solid and he did all he could to provide for and protect both mother and child. On this day it is good to honor those who cherish life and are willing to adopt children who they did not conceive. Son of David, thank you for adopting me as a child of God and for protecting me from the snares of evil. Help me to always say yes to life and to the plans Our Heavenly Father has for me. Amen. So he came to a town of Samaria called Sychar,* near the plot of land that Jacob had given to his son Joseph. [The woman] said to him, “Sir,* you do not even have a bucket and the well is deep; where then can you get this living water? But the hour is coming, and is now here, when true worshipers will worship the Father in Spirit and truth;* and indeed the Father seeks such people to worship him. Friends, today we read the magnificent story from John's Gospel about the woman at the well. The image of thirst is used throughout the Bible to speak of the human longing for God. At the height of the heat of the day, Jesus asks a Samaritan woman for a drink of water. We are on very holy ground for the whole of salvation is summed up here: our thirst for God meets God's even more dramatic thirst for us. Augustine picked up on this in his commentary on the passage: "Jesus was thirsty for the woman's faith." At first, of course, the woman is put off. How could this Jewish man be asking me for a drink? Translate this into spiritual language: how could almighty God be thirsty for my faith and my attention? Jesus' answer is magnificent: "Everyone who drinks this water will be thirsty again; but whoever drinks the water I shall give will never thirst." 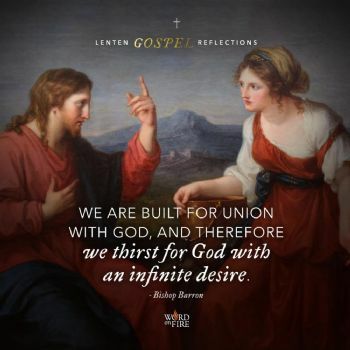 We are built for union with God, and therefore we thirst for God with an infinite desire. What Jesus offers her is the life of grace, the divine life, God's own self. That's the only energy that can ever satisfy our infinite longing. God's plans are for your good. Is this truth real for you? Or do you need to relinquish certain petty securities in order to discover the greater security of God's promise? What temporary good are you clinging to that prevents you from accepting a new gift of grace? Pray today to loosen your grasp just a bit. The Parable of the Lost Son. Friends, our Gospel today is Jesus’ best-known parable and perhaps the greatest story ever told. It tells us practically everything we need to know about our relationship to God, if we but attend to the details carefully. The younger son asks for his share of the estate and quickly squanders it in a far away land, and so it always goes. We are the children of God; we have been given life, being, everything by him; we exist through him every moment. What is represented here so vividly is the moment of sin, which means rupture or division. The young son was forced to hire himself out so as to become a feeder of pigs. No one gave him anything. Coming to his senses at last, he decides to break away and return to his father. The father sees him from a long way off and then, throwing respectability to the winds, he comes running out to meet him. The Bible is not the story of our quest for God, but of God’s passionate, relentless quest for us. He put a ring on his son’s finger—the ring of marriage symbolizing the re-establishment of a right relation between us and God. The parable of the Prodigal Son, which is featured in today’s Gospel, offers many insights and can be digested in many insightful ways. For today it is interesting to look at the concept of God running toward us even while we are far from Him. Over the years many Christian musical artists have taken the theme of God running to us and recording it into a song. One relatively contemporary version is from Bennie Hester and is titled, "When God Ran." If you would like to use this as meditation, here is a link to the song on YouTube. Merciful Jesus, thank you for always missing me and wanting to welcome me home! I am sorry for the many times I turn away from You. Help my broken heart to long for You as much as You long for me. Amen. “There was a rich man* who dressed in purple garments and fine linen and dined sumptuously each day. who would gladly have eaten his fill of the scraps that fell from the rich man’s table. Dogs even used to come and lick his sores. and from the netherworld,* where he was in torment, he raised his eyes and saw Abraham far off and Lazarus at his side. Friends, today's Gospel focuses on the enduring existence of those who have gone before us into death. To say that we are nothing but "bodies" which flourish briefly and then fade away is to miss this dimension of our existence. Though we are tempted to see death as the end, something in us rebels against this idea. This is why Jesus speaks so readily of eternal life. As you know, there was a great debate in Jesus' time within Judaism in regard to question of resurrection. Many, including the Sadducees, denied the idea of life after death; but others, including the Pharisees, affirmed it. Jesus clearly sides with those who affirm it, and his own resurrection from the dead affirmed this belief as emphatically as possible. The Gospel has an enormously important practical consequence: we are related still to those who have gone before us. They are, in a very real sense, gone. But they have not disappeared. They are connected to God and therefore to everything that God loves. They are not so much somewhere else as somehow else and thus they can relate to us in perhaps very intimate ways. Easter would not be possible without Mary, without Mary's faith from the Annunciation even unto the Cross and the tomb. Her faith was like that of Abraham, a faith that expressed itself in obedience to God even in the face of the humanly impossible. Her life is a continual "let it be done to me according to your word." Today, pray the Angelus (or one "Hail Mary") at morning, noon and evening in grateful recognition of Mary's place in salvation history. Then the mother* of the sons of Zebedee approached him with her sons and did him homage, wishing to ask him for something. But Jesus summoned them and said, “You know that the rulers of the Gentiles lord it over them, and the great ones make their authority over them felt. Friends, in today's Gospel the mother of James and John asks Jesus on their behalf to place them in high places in his kingdom. They are asking for two of the classic four substitutes for God: wealth, pleasure, power, and honor. The two brothers specifically want the last two. Power is not, in itself, a bad thing. And the same is true of honor. Thomas Aquinas said that honor is the flag of virtue. It's a way of signaling to others something that's worth noticing. So then what's the problem? The problem is that they are asking for these two things in the wrong spirit. The ego will want to use power, not for God's purposes or in service of truth, beauty, and goodness, but for its own aggrandizement and defense. When honor is sought for its own sake or in order to puff up the ego, it becomes dangerous as well. What's the way out? Jesus tells us: "Whoever wishes to be first among you will be the slave of all; whoever wishes to be great among you will be your servant." When you serve others, when you become the least, you are accessing the power of God and seeking the honor of God. Listen to the Lord today: "You feel me to be far away. Instead, I am right at the door knocking. I offer you freedom—freedom from yourself. You will experience my power to save as soon as you place your life into my hands." Try to discern what God is offering you today. Be merciful, just as [also] your Father is merciful. “Stop judging and you will not be judged. Stop condemning and you will not be condemned. Forgive and you will be forgiven. Friends, today's Gospel is a clarion call for us to be merciful. The whole purpose of the Church—the priesthood, the Mass, the sacraments, good preaching, the corporal and spiritual works of mercy—is to make saints. There really is no question more important than this one: what does it mean to be a saint? Well, to be a saint is to be holy, and to be holy is to follow God's will, and God's will is always a will to love, and love is willing the good of the other. So to be a saint is to will the good of others. Easy enough to say, but the hardest thing in the world to do! What makes us "blessed" or "happy" is precisely holiness. And Jesus says, "Blessed are the merciful, for they will be shown mercy." In many ways, this is the heart of the matter. Chesed is the relevant word in Hebrew, translated wonderfully in the King James as "tender mercy." This is what God is and what he invites us to participate in. * And he was transfigured before them; his face shone like the sun and his clothes became white as light. * And behold, Moses and Elijah appeared to them, conversing with him. * When the disciples heard this, they fell prostrate and were very much afraid. Friends, today's Gospel recounts the story of the Transfiguration. Here the glorified Jesus represents the fulfillment of the Old Testament revelation, symbolized by Moses, representing the law, and Elijah, representing the prophets. Let's look at the two basic divisions. God gave the Torah, the law, to his people, in order that they might become a priestly people, a holy nation, a people set apart, in the hopes that they would then function as a sort of magnet to the rest of the world. But the law didn't take. From the very beginning, the people turned away from its dictates, and became as bad as the nations around them. And then the prophets. Repeatedly we hear the call to be faithful to the Torah, to follow the ways of the Lord. The prophets constantly turn on Israel itself, reminding her of her own sinfulness. And then came Jesus, God and man. Jesus did what no hero of Judaism had ever done. He fulfilled the law, remained utterly obedient to the demands of the Father, even to the point of laying down his life. He brought the Torah and the prophets thereby to fulfillment. Psalm 119: Blessed are they who follow the law of the Lord! In Deuteronomy today Moses encourages the Israelites to follow God’s laws and commandments, but to do so with all your heart and with all your soul. In essence we obey God’s decrees because we love Him. We may not understand why we are asked to follow certain rules, but through our love we develop trust and faith that what God asks us to do is good. “No, you are not being punished,” Nannette patiently responded. “We have a couple of mothers who are sick and some others who are out working. All of us need to pitch in so that our house stays in order. Plus, I trust that you can handle the extra chores,” Nannette said with a reassuring smile. On this Saturday when we may be pulled in several different directions let’s be sure we have our spiritual compass set accurately. If we know God is asking us to follow Him but someone else is asking us to do something contrary to His will and commandments, let’s always have our heart open to follow the Good Shepherd. Dear Lord Jesus, you are my true Guiding Light. Help me to discern wisely on my actions today and let me not wander into activities that break Your commandments. Amen. * But I say to you, whoever is angry* with his brother will be liable to judgment, and whoever says to his brother, ‘Raqa,’ will be answerable to the Sanhedrin, and whoever says, ‘You fool,’ will be liable to fiery Gehenna. Settle with your opponent quickly while on the way to court with him. Otherwise your opponent will hand you over to the judge, and the judge will hand you over to the guard, and you will be thrown into prison. Amen, I say to you, you will not be released until you have paid the last penny. Friends, our Gospel for today is taken from the Sermon on the Mount. Jesus has symbolically established himself as the new Moses, giving a law upon a mountain. His “you have heard it said, but I say…” has revealed that he has authority even over the Torah. To be clear, the law is not being abrogated here; it is being intensified. The law was always meant to bring humanity into line with divinity. In the beginning, this alignment was at a fairly basic level. But now that the definitive Moses has appeared, the alignment is becoming absolute, radical, complete. And so Jesus teaches, “You have heard it was said to your ancestors, You shall not kill; and whoever kills will be liable to judgment. But I say to you, whoever is angry with his brother will be liable to judgment.” Killing is an action, but that action is rooted in a more fundamental dysfunction: a hateful attitude, a disordered soul, a basic misperception of reality. To be like God utterly, we have to eliminate, obviously, cruel and hateful actions, but we have to go deeper, eliminating cruel and hateful thoughts and attitudes, for God is love, right through. or a snake when he asks for a fish? * “Do to others whatever you would have them do to you.i This is the law and the prophets. Friends, today's Gospel assures us of the power of prayer. When some people ask in a spirit of trust, really believing that what they are asking for will happen, it happens. Just as Jesus suggests in the Gospel, "Everyone who asks, receives; and the one who seeks, finds; and to the one who knocks, the door will be opened." The power of prayer is the confidence that we are being guided and cared for, even when that guidance and care are not immediately apparent. It is what allows someone to live in detachment from all of the ups and downs of life, in the language of Ignatius: "Lord, I don't care whether I have a long life or a short life, whether I am rich or poor, whether I am healthy or sick." Someone that lives in that kind of detachment is free, and because they are free, they are powerful. They are beyond the threats that arise in the context of this world. This is the source of dynamis, real power. This is the power that Martin Luther King, Dorothy Day and John Paul II wielded, world-changing power. “This generation is an evil generation; it seeks a sign, but no sign will be given it, except the sign of Jonah. Just as Jonah became a sign to the Ninevites, so will the Son of Man be to this generation. At the judgment the queen of the south will rise with the men of this generation and she will condemn them, because she came from the ends of the earth to hear the wisdom of Solomon, and there is something greater than Solomon here. At the judgment the men of Nineveh will arise with this generation and condemn it, because at the preaching of Jonah they repented, and there is something greater than Jonah here. Friends, in today's Gospel Jesus tells the crowd that they will receive no sign, except the sign of Jonah, which was a prophetic code for his death and resurrection. Everything Jesus said and did, in one way or another, is an anticipation of his resurrection. The God of Israel, the God of Jesus Christ, is a God of life, a God of the living. He hates death and the ways of death. He hates sin, which brings about spiritual death; he hates physical illness, which brings about bodily death; he hates corruption, which brings about societal death. And so he battles all these things all the way. Jesus heals blind eyes and deaf ears and crippled limbs; he illuminates darkened minds; he liberates imprisoned souls. His ministry is a ministry of life, of the triumph of life over death. * but deliver us from the evil one. * If you forgive others their transgressions, your heavenly Father will forgive you. Friends, the Gospel for today is of great moment, for in it the Son of God teaches us to pray. Our teacher is not just a guru, a spiritual sage, or a religious genius, but the Son of God. This is why the Our Father is the model of all prayer. A desire to pray is planted deep within us, the desire to speak to God and to listen to him. We can forget to pray, neglect to pray, become lazy in prayer, but we can never really lose the desire to pray. And so let us attend carefully to the first words of Jesus' great prayer: "Our Father who art in heaven, hallowed be thy name." Our basic problem is getting our priorities mixed up. We seek all kinds of worldly things—money, pleasure, power, honor—all of which are unsatisfying. What we should desire, first, is God. This is precisely what the prayer to hallow the name of God is all about. It's not that God's name isn't in fact hallowed, but we're praying that we might keep it that way, that we might honor God in all things. We're praying for a radical reorientation of our consciousness. and all the nations* will be assembled before him. And he will separate them one from another, as a shepherd separates the sheep from the goats. Then the righteous* will answer him and say, ‘Lord, when did we see you hungry and feed you, or thirsty and give you drink? * Then he will say to those on his left, ‘Depart from me, you accursed, into the eternal fire prepared for the devil and his angels. Friends, our Gospel today is the scene of the Last Judgment. We hear that the specifics are a matter of love concretely expressed: "For I was hungry and you gave me food, I was thirsty and you gave me drink, a stranger and you welcomed me, naked and you clothed me, ill and you cared for me, in prison and you visited me." And we know the famous connection that Jesus makes: "…whatever you did for one of the least brothers of mine, you did for me." There is something awful about the specificity of these demands. This is not love in the abstract, having affection for "humanity." It is caring for that person who is homeless, for that person who is ill, for that person who is in prison. We do not take our money, our social status, our worldly power, into the next world; but we do take the quality of our love. You might consider doing an examination of conscience at the end of each day, and use as your criterion this passage. Perhaps put it up on your wall or post it next to your bed so that you see it before you go to sleep. * Then Jesus was led by the Spirit into the desert to be tempted by the devil. b He fasted for forty days and forty nights,* and afterwards he was hungry. Friends, our Gospel for the first Sunday of Lent is the story of the temptation in the desert. At every point in the Gospels, we are meant to identify with Jesus. Jesus has just been baptized; he has just learned his deepest identity and mission. And now he confronts—as we all must—the great temptations. What precisely is entailed in being the beloved Son of God? First, the tempter urges him to use his divine power to satisfy his bodily desires, which Jesus dismisses with a word. Having failed at his first attempt, the devil plays a subtler game—the temptation faced by Adam and Eve in the garden, to pretend to be God. And then, last and perhaps greatest of the temptations, power. Power is extremely seductive. Many would gladly eschew material things or attention or fame in order to get it. But Jesus' great answer in Matthew's account is, "Get away Satan!" To seek power is to serve Satan—that's the blunt point of Jesus' response. And leaving everything behind,* he got up and followed him. Then Levi gave a great banquet for him in his house, and a large crowd of tax collectors and others were at table with them. Jesus said to them in reply, “Those who are healthy do not need a physician, but the sick do. Friends, our Gospel for today is the simple but magnificent story of the conversion of Matthew, called Levi by Luke. I urge you to read it in Luke 5:27-32 and meditate upon it this week, for it's about you. There is a splendid painting of this scene by the late Renaissance artist Caravaggio. Matthew sits at his tax collector booth in all of the finery of sixteenth-century Italy. He is surrounded by his wealthy friends and by all of the paraphernalia of tax collecting. Across from him stands the Lord, wrapped in shadow. He stretches out his hand toward Matthew, as a shaft of light falls on the tax collector's table. It calls to mind the hand of God from Michelangelo's Sistine Ceiling, suggesting that conversion is like a new creation. Matthew points his finger at his own chest and looks incredulously at Jesus, as if to say, "you're calling me? The likes of me?" Yes! Jesus calls whom he wills, and Paul tells us in his letter to Timothy that he wants all people to be saved. Even those of us who feel a million miles from him, perhaps sunk in a lifestyle that has alienated us from God, God calls us, just as he did that first-century tax collector. Friends, in today’s Gospel, disciples of John the Baptist wonder why Jesus and his disciples do not fast as John and his disciples do. It is true that, by comparison, Jesus had a freer, more worldly, less obviously “religious” style. He didn’t sequester himself like the Essenes; he didn’t insist on ritual and legal purity like the Pharisees; and, it seems, he didn’t fast and live a life of austerity like John and his followers. And so they ask why he doesn’t encourage fasting among his followers. Jesus’ answer is wonderful: “How can the guests at a wedding fast while the groom is still with them?” Could you imagine people fasting at a wedding banquet? Could you imagine going into an elegant room with your fellow guests and being served bread and water? It would be ridiculous! This great image of the wedding feast comes up frequently in the New Testament, most obviously in the wedding feast at Cana narrative. That’s because Jesus is, in himself, the wedding of heaven and earth, the marriage of divinity and humanity; he is the bridegroom and the Church is the bride. In him, the most intimate union is achieved between God and the world. Friends, our Gospel today lays out Jesus' conditions for discipleship. For all of us sinners, to varying degrees, our own lives have become god. That is to say, we see the universe turning around our ego, our needs, our projects, our plans, and our likes and dislikes. True conversion—the metanoia that Jesus talks about—is so much more than moral reform, though it includes that. It has to do with a complete shift in consciousness, a whole new way of looking at one's life. Jesus offered a teaching that must have been gut-wrenching to his first century audience: "If anyone wishes to come after me, he must deny himself and take up his cross daily and follow me." His listeners knew what the cross meant: a death in utter agony, nakedness, and humiliation. They didn't think of the cross automatically in religious terms, as we do. They knew it in all of its awful power. Unless you crucify your ego, you cannot be my follower, Jesus says. This move—this terrible move—has to be the foundation of the spiritual life. Here we are one day into Lent! Some of us really know how to conquer Lent and don’t have a problem with it, while the rest of us lowly individuals probably forgot yesterday that bacon does in fact count as meat. I place myself in that final category. I have always struggled with Lent, but I think that’s because I grew up with a misunderstanding about what Lent really is. I grew up thinking that Lent was a time to suffer, to give up the things we love, and to be miserable for the sake of being miserable. I think anyone with a brain would detest this idea of Lent and while Lent may include suffering and sacrifice, it is really about change. Just as we have seasons throughout the year we also have seasons in the Church. I know that every year I get excited for fall. The leaves change, it gets a little colder, there are more bonfires, and I love Halloween and Thanksgiving. But the thing I love most is the changing color of the leaves. Every season brings with it some sort of change and whether we like that change or not, it helps bring us to the next season. For example, I am not a huge fan of winter, but winter has to come in order for us to get to spring. It has to freeze so that eventually it can thaw and allow the trees to bud and bring about beautiful fruit. Sometimes we have to go through something that may not be ideal in order to get to the things that really make us joyful. It is the same with Lent. Some of us may not be particularly fond of the sacrifice and struggle that comes with Lent, but the more we allow ourselves to change throughout this season, the more fruitful we will be in our daily lives. Although sacrifice may sometimes hurt, it ultimately makes us stronger and brings us to greater joy. Instead of going into Lent with a negative attitude about sacrifice, let’s all look to the sacrifice of the cross and be thankful that Christ was willing to give the ultimate sacrifice in order that we might be changed. When you give alms, do not blow a trumpet before you, as the hypocrites* do in the synagogues and in the streets to win the praise of others. Amen, I say to you, they have received their reward. “When you pray, do not be like the hypocrites, who love to stand and pray in the synagogues and on street corners so that others may see them. Amen, I say to you, they have received their reward. “When you fast,* do not look gloomy like the hypocrites. They neglect their appearance, so that they may appear to others to be fasting. Amen, I say to you, they have received their reward. so that you may not appear to others to be fasting, except to your Father who is hidden. And your Father who sees what is hidden will repay you. Friends, today’s Gospel at the beginning of Lent asks us to do three things: pray, fast, and give alms. Let’s focus today on prayer. Studies show that prayer is a very common, very popular activity. Even those who profess no belief in God pray! The dark cloud that has brooded over our lives, turning us in on ourselves and outward in violence, has been removed. The power that has held us ransom has been overthrown. The cherubim throne has been prepared, the bearers are ready and waiting, the bridal chamber is in order, the food is provided, the everlasting houses and rooms are in readiness; the treasures of good things have been opened; the kingdom of heaven has been prepared before the ages." On this Good Friday, it's important to remember that Jesus came primarily as a warrior whose final enemy is death. I know how easy it is to domesticate Jesus, presenting him as a kindly and inspiring moral teacher, but that is not how the Gospels present him. He is a cosmic warrior who has come to do battle with all of those forces that keep us from being fully alive.